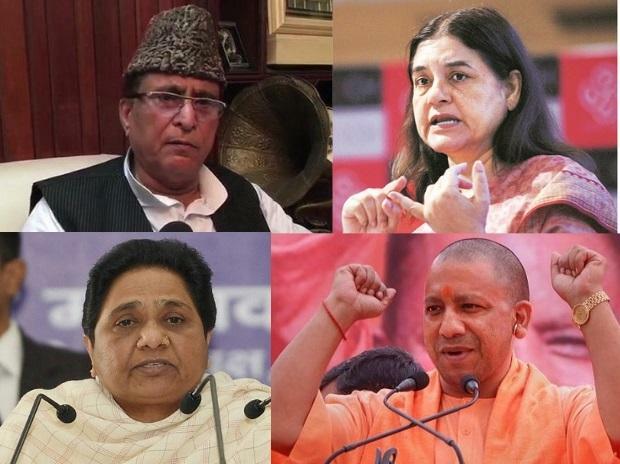 The Election Commission (EC) on Monday “censured” Uttar Pradesh Chief Minister Yogi Adityanath, Bahujan Samaj Party (BSP) chief Mayawati and Union minister Maneka Gandhi for their allegedly communal remarks. 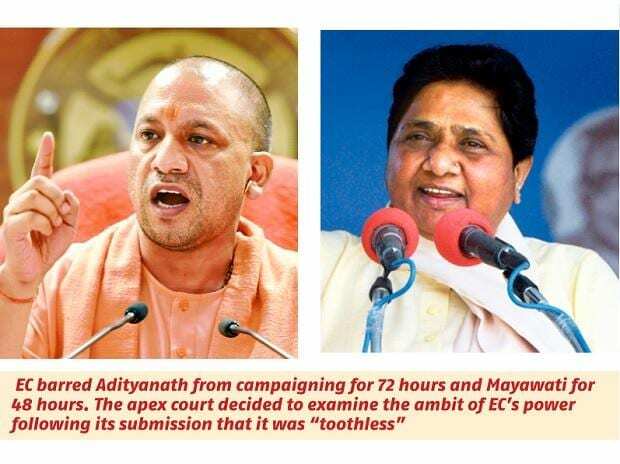 It barred Adityanath from campaigning for 72 hours, and Gandhi and Mayawati for 48 hours each. The EC also reprimanded Samajwadi Party's Rampur candidate Azam Khan for his indecent remarks against the Bharatiya Janata Party’s (BJP's) Jaya Prada. Khan too cannot campaign for 72 hours. The four orders come into effect on Tuesday morning. The EC action came in the wake of the Supreme Court earlier in the day expressing its displeasure at the poll panel not taking action against political leaders for communal and hate speeches. The apex court decided to examine the ambit of the EC’s powers following its submission it was “toothless”. A Bench headed by Chief Justice of India Ranjan Gogoi, hearing a PIL (public interest litigation) petition on the subject, was irked enough to threaten to ask that the chief election commissioner be present before the Bench within half an hour. “So what about Mayawati? She was supposed to reply to you (poll panel) by April 12. She has not replied till today. What does the law permit you to do in such cases? Answer us!" said the Bench, also comprising Justice Deepak Gupta and Justice Sanjiv Khanna. EC counsel said: "The power of the EC in this behalf is very limited. We can issue notice and seek reply but we cannot de-recognise a party or disqualify a candidate ... we can only issue advisories and in the case of a repeat offence, register a complaint." The Bench said: "So you are basically saying you are toothless and powerless against hate speeches." Ticked off by the SC, the Election Commission issued the two orders against Adityanath and Mayawati by afternoon. Later in the day, the Congress asked why it was that the EC was yet to take action against Prime Minister Narendra Modi for his appeal to voters to ask them to vote in the name of jawans of the Central Reserve Police Force killed in the Pulwama terror attack. The party demanded the EC take action against Prime Minister Narendra Modi as well. In its order on Adityanath, the EC said it "strongly condemns" the impugned statement made by him and "censured" him for "misconduct". In another order, the EC censured and "strongly" condemned Mayawati for her remarks. It barred her from campaigning for 48 hours or two days. The EC issued Mayawati notice for her speech in Deoband in which she appealed to the Muslims to not vote for the Congress. The BSP chief has violated the Model Code of Conduct, the poll panel found. The EC served Adityanath notice for his "Ali" and “Bajrang Bali” remarks while addressing a rally in Meerut. At a press conference on Monday evening, Mayawati said the EC's show-cause notice sent to her did not state that she delivered a speech that incited communal sentiment, and had only one allegation that she was asking votes in the name of one particular community. Mayawati said the EC had given a one-sided decision and denied her fundamental right of freedom of speech and expression. “This day will be known as the black day in the EC's history,” she said. The EC said Khan's comments on Jaya Prada were indecent. The ban on Shah was lifted in a few days after he assured the poll body he would not disturb public tranquillity and law and order. Since Khan had not given a similar assurance, the ban on him had continued. The SC was hearing a petition by Harpreeet Mansukhani, an NRI Yoga teacher based in the UAE, seeking a direction to the EC to take “strict action” against political parties if leaders made remarks based on caste and religion in the run-up to the elections.